Today, there are ton of front end frameworks and libraries have appeared and developers are very confused about which one to choose ofr what purpose. There is a major debate between Angular vs React vs Vue. I've explored various documents and online articles and came up with different statistics and a matrix. 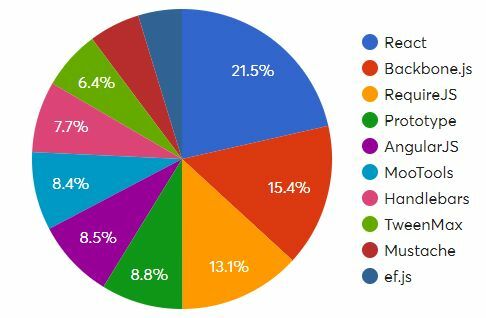 Take out from above analytics based on 20,000 developers survey, React is the most popular and most liked framework among developers. Another side Vuejs, Preact, Ember, and Polymer frameworks are the most interesting frameworks to learn in the future. However, this is a result of only 20,000 developers all over the Globe. Majority of developers are unaware of this survey they may have a different opinion as well. There are over 30 million developers in the world. Read more here: How many developers are there in the world. You can see the following tabular data for Github based stats. Based on the above statistics, VueJS is most starred front end framework on GitHub. You may thank PWA since it is one of the fastest evolving framework for progressive web apps. There is also a shorter and easier learning curve if you know HTML, CSS and JS, then it is easy to grab Vue js concepts. Another reason could be that, Vue is developed as a community and developers. Unlike Angular and React, where they are backed by Google and Facebook. Not many open source developers are fond of large corporations. 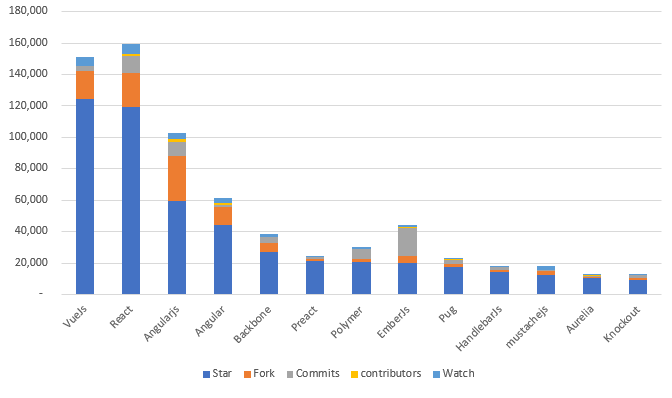 As above chart displays the breakdown of JS front end frameworks and libraries usage. Other than the above chart, I've also prepared the same data in a tabular form with live number of websites. From above statistics, React is the most used frameworks on Internet Websites based on Wappalyzer. Preact is a fast 3kB alternative to React with the same modern API. Components & Virtual DOM. Handlebars provide the power necessary to let you build semantic templates effectively with no frustration. Handlebars are largely compatible with Mustache templates. In most cases, it is possible to swap out Mustache with Handlebars and continue using your current templates. Mustache is described as a "logic-less" system because it lacks any explicit control flow statements like if and else conditionals or for loops; however, both looping and conditional evaluation can be achieved using section tags processing lists and lambdas. React was created by Jordan Walke, a software engineer at Facebook. Facebook uses React extensively in their products (Facebook, Instagram, and WhatsApp) to solve performance issue on facebook for lower internet connectivity. Due to this success, it is adopted by most Big and small size company. Vue also referred as Vue.js. It was developed by ex-Google employee Evan You in 2014. Over the last two years, Vue's popularity increased, even though it doesn’t have the backing of a large company. Vue’s contributors are supported by Patreon. Vue 3, currently in the prototyping phase is planning to move to TypeScript.